So a funny thing happened at Nordstrom the other day. I did something 100%, completely unlike me. And my mom was there to witness/encourage. I told her she can't come back to town anymore now. Let me give you some backstory. I ordered some Steve Madden Intyce boots last fall and loved them for about a month or two. That smart little wedge heel was the first thing to go. It wore and wore and wore, and by December, it was just painful to wear them. Additionally, they began to slouch, badly. It bothered me that they weren't as tall as they once were. They just looked funny, all baggy and beat up. That's why, to my sister's chagrin, I wore my Hunter boots almost exclusively until the first hint of spring. So, I was planning to replace the Steve Madden boots at some point before fall. I hate that, but I'd stopped wearing them. I eyed my options during end-of-season sales, and have been awaiting the pre-season sales, but hadn't really given it a ton of thought other than it's probably time to invest in some high-quality boots that will last longer than a season. On Sunday, I took my mom, who came to spend the night with me on Saturday, to the mall after lunch. She hadn't seen Nashville's Nordstrom yet so I figured we would go in while we were there. I wandered over to boots. They had the pair I've been eying on display. Since they tend to go out of stock quickly, I asked to try them on while I could. Never hurts to try, right? Research. I imagine the look in my eyes once I stood up is what my face will look like when I'm someday telling my mom "Mama, he's the one." I. love. them. I put them on as soon as we got back to my condo on Sunday and then again when I got home from work yesterday. I'm sure my downstairs neighbors are thrilled that I have new boots to break in. 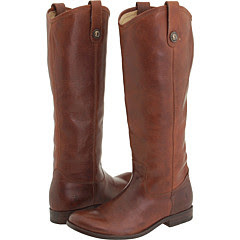 A pair of Frye boots is THE last thing I ever planned to purchase on Sunday, let alone this calendar year, but oh well. I don't make spur of the moment purchases like that. It feels weird and makes me a little lightheaded. But I know they are great quality and if the past 48 hours is any indication, I have a feeling they will be worth every penny and then some. If you ever see me in a pair of boots that aren't these, my Uggs or my Hunters, you have my permission to smack me. That's the style I've had my eye on, too! They are beautiful! You will love those and wear them with everything. And it's cost per wear that really matters, right?